MODEL: PF30. BB Shell Type PF30. Interface PF30. BB Bearing ACB. TorqTite bottom brackets require two Enduro TorqTite wrenches for proper installation. 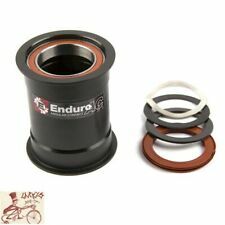 Enduro BB386EVO TorqTite Bottom Bracket. TorqTite bottom brackets use a threaded center sleeve for a perfectly aligned and creak free installation. Enduro Steel Bottom Brackets. - Left bearing uses Enduro's special combination bearing spacer/reducer/seal. - BB Shell Width (mm): 90 mm, 95 mm. - Bottom Bracket Shell I.D. : 37. - Kit includes 2 steel bearings and 2 seals. - Help eliminate creaking bottom noises using this internally threaded bottom bracket - Choose either the 30mm spindle specific model or the 24mm version with adapter to run GXP 24/22mm spindle cranks - Angular contact stainless steel bearings - Enduro TorqTite wrenches (2) are required for installation, sold separately, AB-9008. - Help eliminate creaking bottom bracket noises or issues using this internally threaded bottom bracket - Angular contact bearings - Compatible with all 24mm cranksets. Reducer for GXP included - Enduro TorqTite wrenches (2) are required for installation, sold separately, AB-9008. TorqTite bottom brackets require two Enduro TorqTite wrenches for proper installation. Use QBP part number TL8908. Enduro TorqTite Stainless Bottom Brackets. TorqTite bottom brackets use a threaded center sleeve for a perfectly aligned and creak free installation. Model: TorqTite PF30 / 24mm. Weight: 157 grams. Shell: PF30. Choose either the 30mm spindle specific model or the 24mm version with adapter to run GXP 24/22mm spindle cranks. interface: 30mm spindle. Manufacturer Number: 6806. This 440C stainless steel material provides maximum corrosion resistance bearings. 440C stainless steel balls and races. Our motto is 'All Riders, No Attitude!'. We're here to provide friendly and personal service for all cyclists. Enduro Steel Bottom Brackets. Bottom Bracket Shell I.D. : 37. Our motto is 'All Riders, No Attitude!'. We're here to provide friendly and personal service for all cyclists. Gap30 Cycles. BB Shell Width (mm): 95. Model # 6806-LLB Enduro 6806 ABEC-3 Sealed Bearing. Enduro Part # BB 6806 LLB/C3. 2 x ENDURO BB30 Steel Bottom Bracket Bearings. Bearing I.D. 30mm. Bearing O.D. 42mm. Bearing Thickness 7mm. Kyodo Yushi SRL grease or equivalent. Bearing kits for Shimano, FSA, and Race Face outboard bottom brackets. Enduro BK-5410 Bearing Kit For Shimano Hollowtech II and Race Face X-Type Bottom brackets.